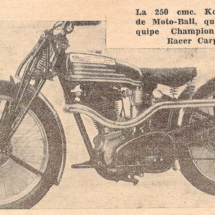 Koehler-Escoffier ” model K35S “, 350cc, “Super Standard”, engine Chaise, overhead valves and two exhaust pipes which was built between 1929 en 1931. 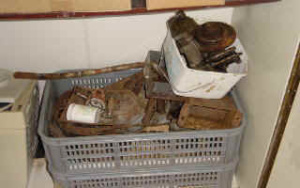 Parts in crates. What motorcycle had been bought? In 2001 my husband bought a “very nice motorcycle in crates”. He had bought it in an enthusiastic mood, although he didn’t actually know how it should look like. 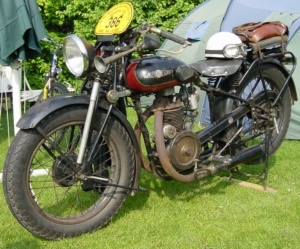 The trader had sworn that the motorcycle was complete and he had even added some spare parts. 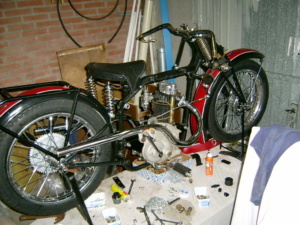 Eventually, the motorcycle was complete. Only the chain protector was missing. But the restoration took a lot of time, because it was a hell of a job to complete the puzzle. The first breakthrough came at Whitsun in Ibbenbüren, Germany in 2002. To our great delight we saw a Koehler there. This motorcycle was exactly like ours only the exhaust pipes didn’t match. Fortunately, from that moment on we knew that we had a K 35 model. What we didn’t know yet that it was a K35S. The “S” refers to “super standard” or a sports model. We thought to recognize that fact from the exhaust pipes which are curved back up, but this subject will be dealt with later. So taking apart wasn’t necessary anymore. 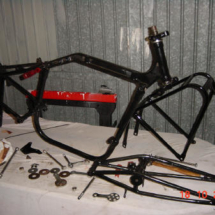 On a sunny summers day in 2003 we decided to start sandblasting the frame, mudguards, luggage rack, standard and some other small parts. It took several Saturdays to complete the sandblasting, because sandblasting in the open sky takes up a lot of sand, time and effort. 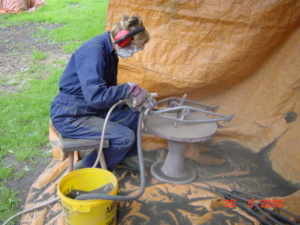 And the sandblasted parts had to be undercoated immediately to prevent the parts from getting rusty again. 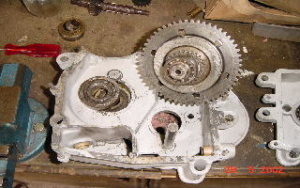 In the mean time the gearwheels and shafts of the engine block were cleaned. Putting the engine block together again took less time as expected. 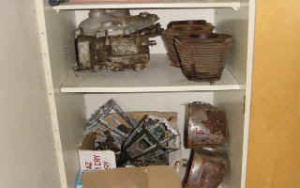 Sometimes it took some trouble to find the best or correct gearwheel because two engines blocks were included in the deal. The cylinders that we got, weren’t what we had hoped for. 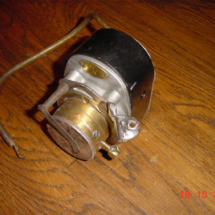 A new piston was included in the deal, but it was, actually, a piston for use in a generator, so it had to be adjusted. We left the adjustment of the piston and the overhaul of the valves and cylinder to the expert hands of the local engine overhaul shop. Picked the best cylinder and looked if the exhaust pipes were fitting. 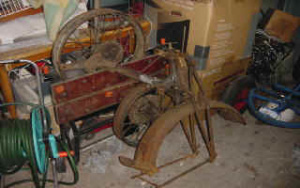 After sandblasting and undercoating the mudguards and frame were spray painted in the right colours and safely hidden under the bed. 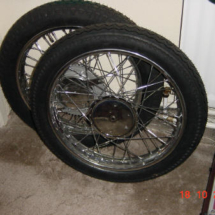 Delivery of the spokes and rims took quite a while, so that the Koehler Escoffier wasn’t standing on his wheels until spring 2004. Standing on his wheels, progress seemed unstoppable, but reality was far from that. The engine mount plates weren’t the correct ones. Fortunately, we had made all kinds of detailed photo’s of the Koehler in Ibbenbüren, so that we were able to analyze the problem at ease. I made some cardboard models of which my father made iron ones. 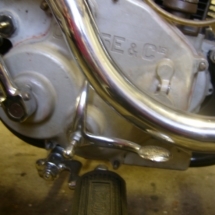 This method was also used to reproduce the front brake fastener. 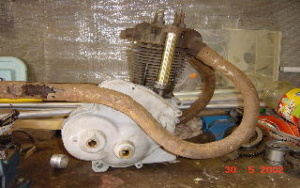 After attaching the engine block into the frame, the cylinder e.d. 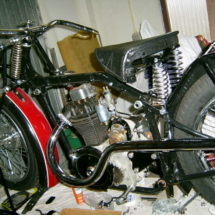 could be assembled. And, after attaching the gear shifter rods, we wanted to know if there was any movement. At this time everything looked fine. 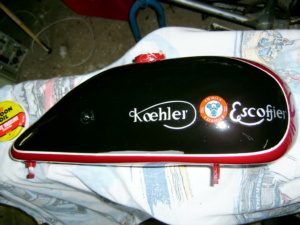 The fuel tank halves weren’t treated yet and so they gradually got colour and transfers (descriptive markings) in the summer of 2004. 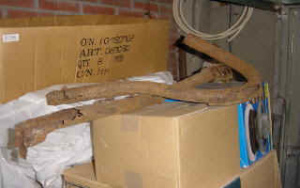 The exhaust pipes were copied from the rusty ones included in the deal. The exhaust pipes were made in the old fashioned way by filling iron pipes with sand and, while heating, bending them around a wooden model. 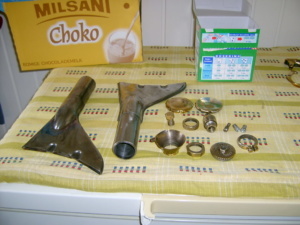 Still, it took quite some time before they could be assembled, because they had to be polished and chrome plated first. I bought the silencers at an oldtimer market. 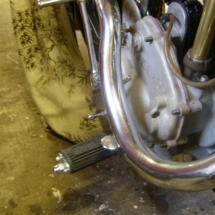 During the assembly of the two fuel tanks and the strip that comes across them, it seemed that we had made a mistake in the assembly of the handle-bar or the front-fork, because the strip didn’t fit at all. So…watching photo’s again. And yes, the handle-bar damper wasn’t assembled as it should. It was quite an undertaking to take apart the fuel tanks, but what has to be done, must be done. 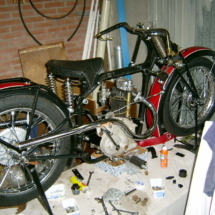 In this manner we solved many problems, until we wanted to assemble the kick starter, foot pegs and clutch. The exhaust pipe wasn’t in the right way. Did we had to re-adjust everything or was it the wrong exhaust? Hand made exhaust pipe which turned out to be of no use. 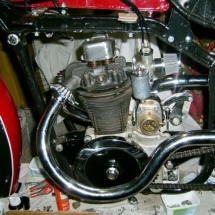 “As to the engine, I advice you to look at the website of the Dollar club, which motorcycles were fitted with Chaise engines: http://amicaledollar.free.fr. 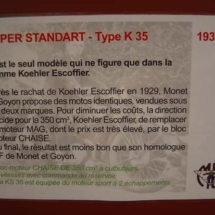 Monet Goyon and Koehler Escoffier rarely used Chaise engines. 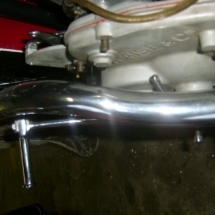 As to the exhaust pipes: I do not know any model with curved back exhaust pipes!!!! This is why all this problems occur and it is most likely that these pipes aren’t genuine. Well, here I am! Thinking off finishing the project, the exhaust pipes had to be replaced by proper ones. And that wasn’t the only problem, because it didn’t want to get into gear anymore. 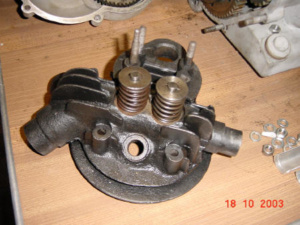 This was a most annoying problem, because we had to take the engine block apart again. All these problems had led to the not finishing of the Koehler project. 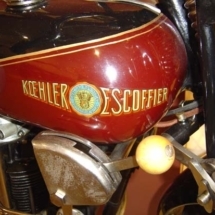 he Koehler Escoffier has been sold and I hope it will run on the road these days. 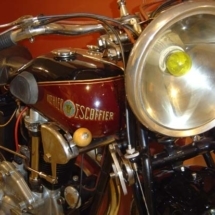 Koehler-Escoffier….K35 ….350cc … Engine Chaise..Bore x stroke : 75×79 ..overhead valves with enclosed valve rocker arms (gear). 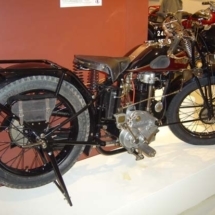 This engine with a 3 speed gearbox, was build by L’Omnium Métallurgiques et Industriel, rue Auguste-Lançon, Parijs (13° arrondissement) and delivered 11 HP to 4000 strokes. It has a directed drip lubrication to the carter which acts as oil reservoir. Oil recommended in those days: Kervoline produced by Etablissements Quervel Frères, founded in 1845 te Aubervilliers, rue du Pont. This oil was produced and reffained in Pennsylvenia (USA). 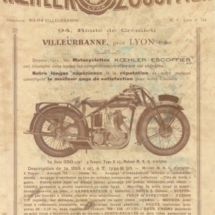 The firm Quervel supplied to almost every French motorcycles brand, by which the firm obtained many information necessary for finding historical facts about French motorcycles. M. Koehler-J. Escoffier, Guignet, Villeurbanne, later Gaydon-Persas-Guignet, Villeurbanne and Koehler-Escoffier, Macon (1912-1957). 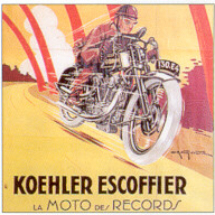 Koehler and Escoffier founded this trade mark in 1912, but in 1914 the production had to be ended due to the death of Jules Escoffier and the military enlistment of Marcel Koehler. 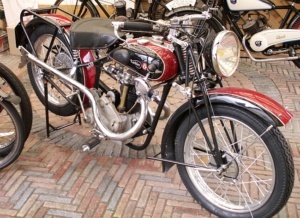 They made a 500 cc V-twin, de Mandoline, in that short period of time. The technique matched the Magnat-Debon one cylinders technique due to the fact that Jules Escoffier had worked as an engineer there. The trademark was incorporated into an other company so that it was revived in the twenties. The trademark became known by the serial production of 996 cc OHC V-twins with bevel drive. 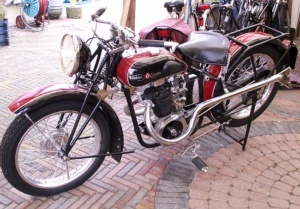 Besides were the 245- and 490 cc overhead valves, single cylinders. 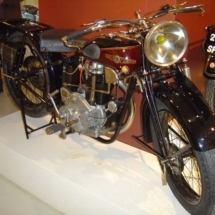 In 1929 the company was incorporated into Monet-Goyon and, from that moment on, 98- till 249 cc Villiers-two stroke engines were used. 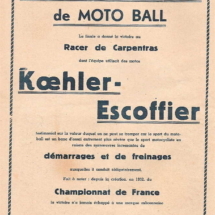 When Monet-Goyon closed its gates in 1957, the Koehler Escoffier brand went down with it, ofcourse.